The HiTemp140 is a rugged, high precision, temperature data logger that is build for use in harsh environments. It has a very high accuracy (±0.1°C !! ), and can withstand temperatures up to 140°C (284°F). Together with the durable thermal shield this rugged system can be placed in and withstand temperatures from -200°C to 250°C, making it ideal for use in autoclave validation, monitoring food processing and dishwasher testing. 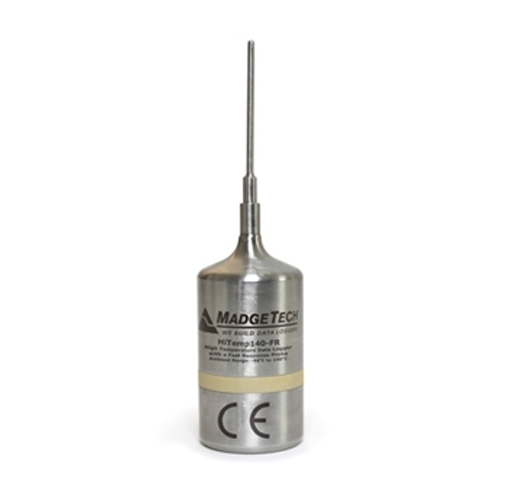 Using the MadgeTech software, the data logger is fast and easy to setup. Place the HiTemp140 into the IFC400 docking station (sold separately). Using the software, an immediate or delay start can be chosen, as well as the reading rate. Select Start to program the settings and start the data logger. access to configuration options. Data may be read out without the password.